Got a new dog this weekend! 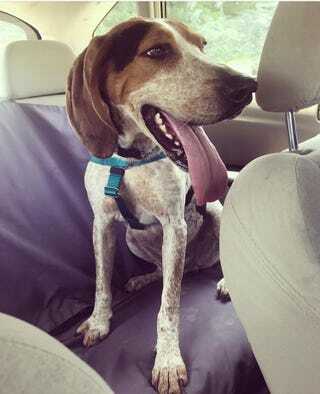 He’s a 3 year old English coonhound that we adopted from a shelter in Ohio. We’ve named him Curzon Dax. He’s settling in very nicely. Super duper friendly and is getting along well with our other coonhound. We were expecting him to be completely untrained but it seems like someone actually did spend some time working with him. He walks nicely on the leash, already is crate trained, and seems to understand that he’s expected to go to the bathroom when taken outside, though we’re still working on some peeing-in-the-house issues. And just like our other coonhound, he loves to bask in the heat.